The body is intelligent, but it is also loyally responding to the thoughts, feelings and experiences of its owner. Innately we know this. We only have to look at someone’s body and posture to know how they are feeling. A lot of our expressions confirm the connection between mind and body – often by describing a feeling in terms of the physical. For example: “burden on my shoulders”, “problem weighing me down”, “you’re a pain in the neck”, “butterfly’s in my stomach”, “break into a cold sweat”, “get off my back”, “get things off my chest”, “you are making my blood boil”, “stick my neck out for someone”. Our body and mind are not separate entities as we are led to believe. When we have physical trauma, there is always a mental & emotional response. When we have mental & emotional trauma, there is always a physical response. All trauma in the body is stored in a package with both aspects. This explains the release of trauma with Craniosacral Therapy where there is often an emotional release experienced after a physical release of tissue. The placebo effect is well known – where patients given medical intervention such as medication or even “sham surgery” still exhibit improvement in their condition. Even the colour of the fake pill given has an effect – green pills help ease anxiety, while yellow pills are most effective at treating depression. Pills that have a brand name are more effective than pills that don’t have any writing on them. Multiple personality disorder or dissociative identity disorder is a condition where sufferers exhibit personality and behaviour changes as they switch between their different identities. What’s interesting is when one identity has a health issue, they exhibit measurable physiological changes as they adopt this identity. For example if one identity has diabetes and one doesn’t there will be a measurable difference in blood sugar levels as the diabetes identity is adopted. Dr Masuru Emoto is well known for his experiments with water. He devised a way to photograph the crystalline structure of water just before it freezes. What he didn’t expect was the differences in crystalline photos and after careful scientific examination realised it was the technician’s thoughts & feelings that were affecting the results. 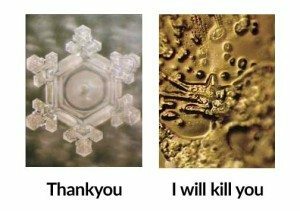 He then photographed numerous different water samples with different words on the jars – each evoking a different conscious thought such as “thank you” and “I will kill you”. The results are amazing and you can see them all in his book, called “The Hidden Messages in Water”. The implication of this experiment is interesting because your body is around 60% water. Well the good news is, every small thought and feeling doesn’t have much effect on its own. But long term negative habitual thinking or repressed feelings can build up and have an effect on your health. What is your body telling you about your consistent thoughts and feelings?